Once you've posted a new topic or reply within InstantForum you may notice you've made a mistake or you may simply wish to update your topic or reply. 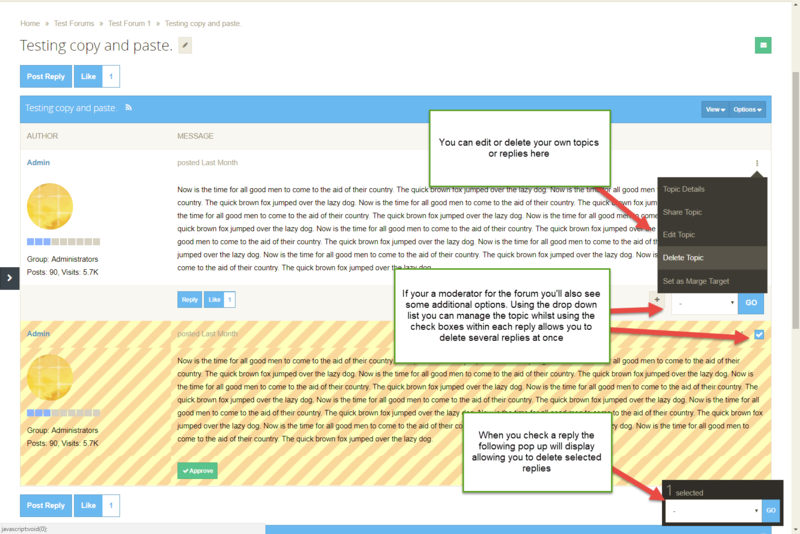 By default within InstantForum you can edit any topic or post you create. Clicking the Pencil icon will allow you to edit the subject and message for your topic. Clicking the trash can icon will ask you to confirm if you wish to delete the topic. NOTE: When deleting a topic you've posted if that topic already has replies those replies will also be deleted when you delete the topic. Similar to editing a topic you've posted you can edit a reply you've posted by locating the reply and using the pencil and trash can icons to edit or delete your reply. InstantForum administrators may configure InstantForum to require that edited posts are moderated again. If this is enabled this may mean when you edit your post your post will be automatically queued or hidden until a forum moderator approves your changes.